With custom optical molding, it’s very important to get the optical molder involved during the program concept phase. This often-overlooked first step is crucial to program success. There are many factors that will determine the success or failure of molding a plastic optic. GS Plastic Optics engineers are experts in design for manufacturability and specialize in working with you to converge quickly on high-confidence cost-effective solutions to make your program a success. 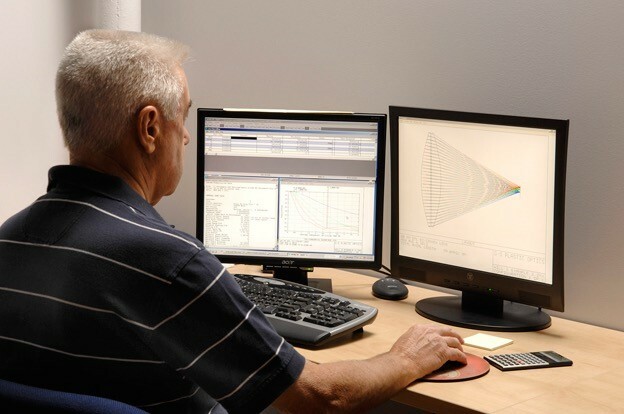 During the custom design phase, GS Plastic Optics engineers address issues such as part shape, material selection and tolerances and will model and optimize the design of your optic for manufacturing using injection molding. GS Plastic Optics uses sophisticated software packages such as: Solid Works, Solid Works Mold Filling Analysis, Zemax, TF Calc, Diffsys, and MasterCam, to maximize product performance while minimizing manufacturing costs and lead times. One of our GS Plastic Optics engineers will work closely with you to learn more about your projects specific technical needs.